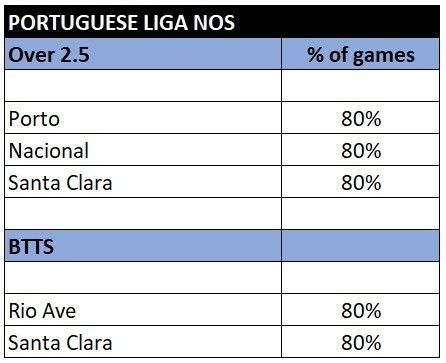 Over 2.5 goals and both teams to score are two of the most popular markets in football betting. 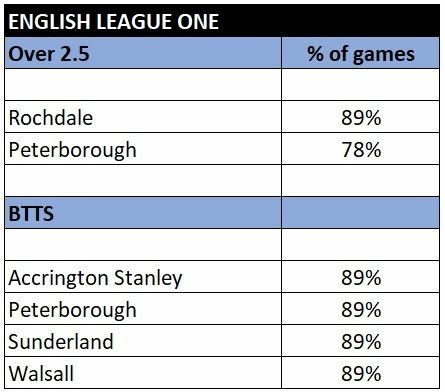 Punters sometimes find that picking selections from those markets is a little easier than settling on an outright result prediction for the same fixture. 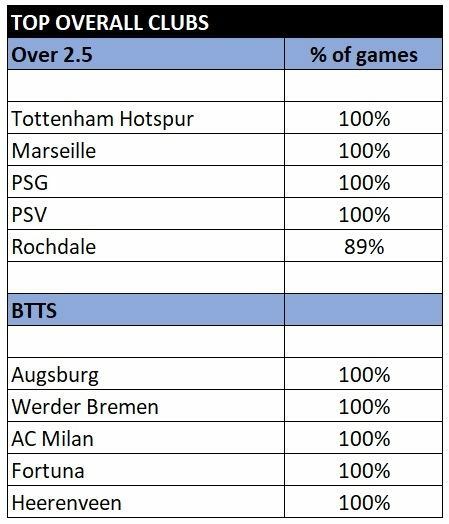 Of course, some teams are involved in high scoring matches much more often than others, making them great sides to back in the aforementioned markets. Read More: Check out all of our expert match previews, predictions and betting tips here. Tottenham Hotspur are the only club from England’s four top divisions who have seen over 2.5 goals scored in every one of their league matches so far this season. 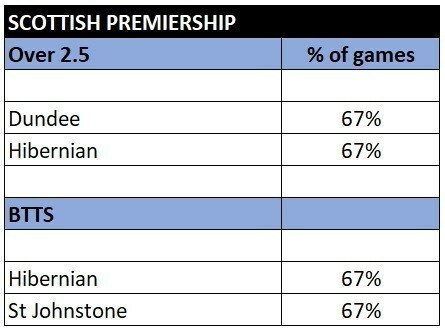 Interestingly, four of their six Premiership matches so far just about squeezed over the mark with each contest finishing 2-1 to either team. 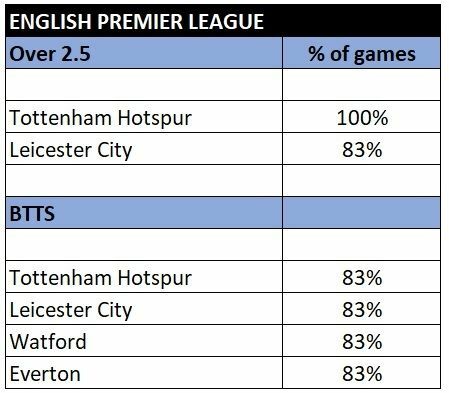 Tottenham’s Premier League matches averaged 2.89 goals per game last season, though just 45% of those individual matches finished with over 2.5 goals scored in them. The numbers suggest that their over 2.5 goal per game percentage could slip soon. Read our expert Huddersfield Town vs Tottenham Hotspur match preview, betting tips and predictions here. 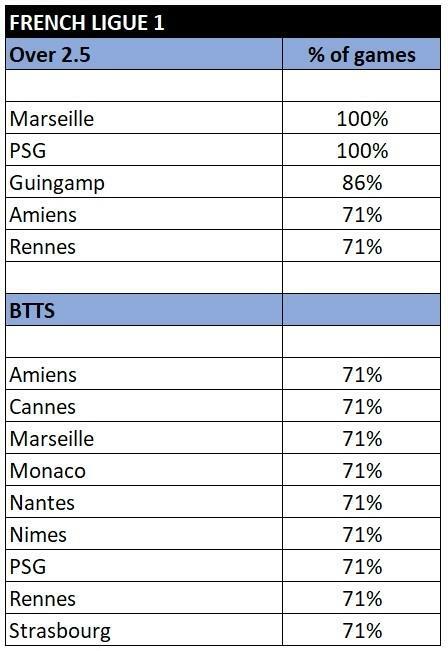 100% of the Ligue 1 games involving Marseille and PSG in 2018/19 have passed the 2.5 goal mark and both clubs held healthy overall statistics in that metric last season too. 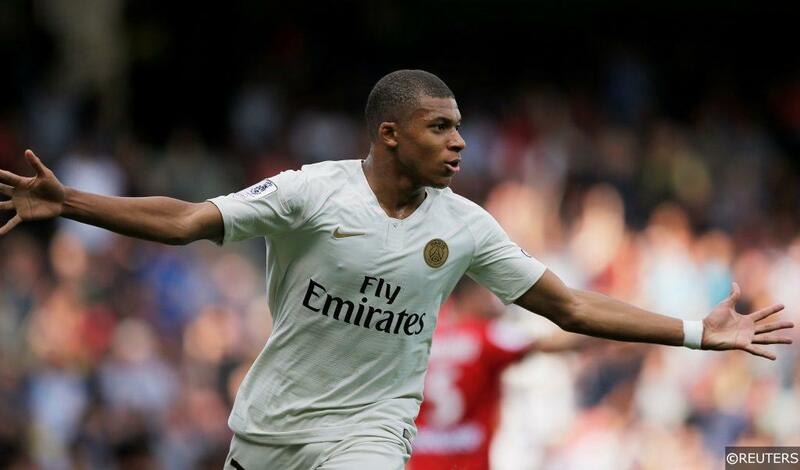 71% of PSG’s league fixtures and 61% of Marseille’s finished with over 2.5 goals scored in them in 2017/18, which suggests both clubs are more than capable of maintaining their goal-getting consistency for a while. Similarly, 76% PSV’s total Eredivisie matches in 2017/18 saw over 2.5 goals scored in them. 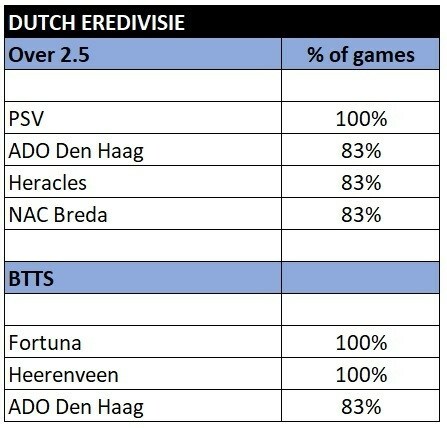 The Dutch champions take this season’s 100% over 2.5 goal per game record with them to Breda to take on NAC this weekend. 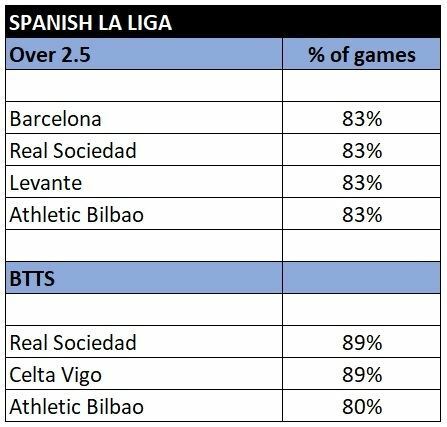 83% of the host’s matches have finished with over 2.5 goals registered in them too. Check out our NAC Breda vs PSV Eindhoven match preview, betting tips and predictions here. In the both teams to score market, Augsburg and Werder Bremen from the Bundesliga are the teams to keep an eye on as are AC Milan in Serie A. 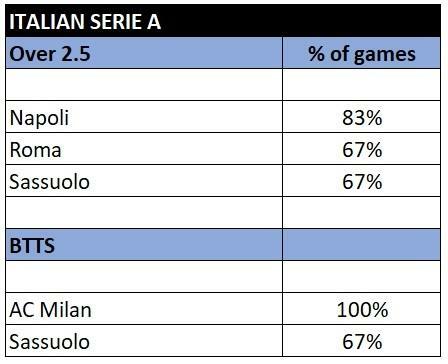 Both teams have scored in each of AC Milan’s last nine Serie A fixtures in total, in a sequence stretching back to the tail end of last season. Like Milan, Fortuna from the Netherland’s Eredivisie are on a run of nine straight league games where both teams have scored. Heerenveen’s league matches in 2018/19 also have an unblemished both teams to score rate. 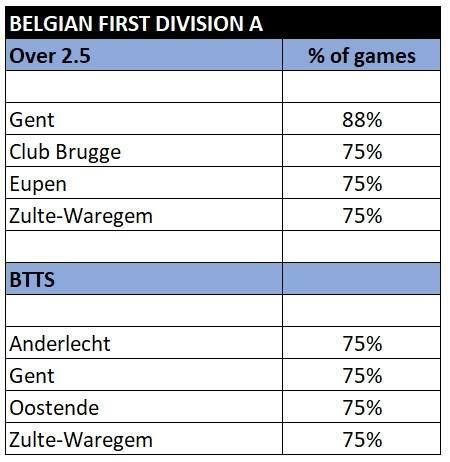 On Saturday, they lock horns with an ADO Den Haag side who popped up in both the over 2.5 and BTTS Eredivise list above. Check out our Heerenveen vs ADO Den Haag match preview, betting tips and predictions here. Categories: Blog and Football. 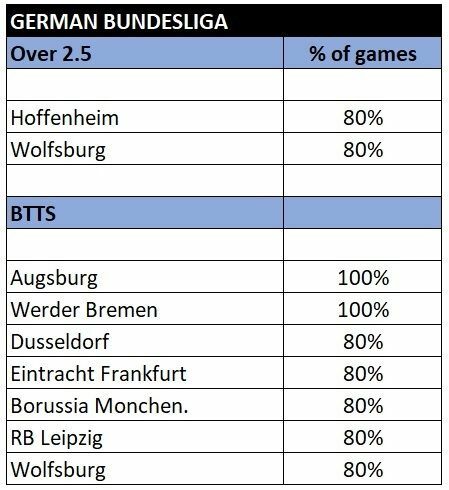 Tags: betting tips, btts, football tips, and over 2.5. League: England Championship, England League 1, England League 2, England Premier League, French Ligue 1, German Bundesliga, Holland Eerste Divisie, Italian Serie A, Scottish Premiership, and Spanish La Liga. Sports: Football.